Save AED 140 (36.94%) – Earn 23 Shukrans What is Shukran? Shukran is the Landmark Group’s award-winning loyalty programme in the Middle East, which allows you to earn Shukrans when you shop any of our brands. Keep your baby safe and snug in this adorable small bed, designed for utmost comfort and protection of your little one. 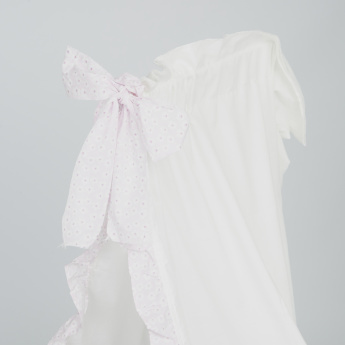 Featuring charming prints along with a frill detail, this small bed easily accentuates the look of your baby's room. The durable metal frame and smooth wheels allow easy transportation.